This week returns to one of the odder monsters in the Mansions of Madness: the Hounds of Tindalos. The hounds were added into the Cthulu mythos by Frank Belknap Long and have never had an ‘official’ description or look. The closest I could find was that they have blue ichor. 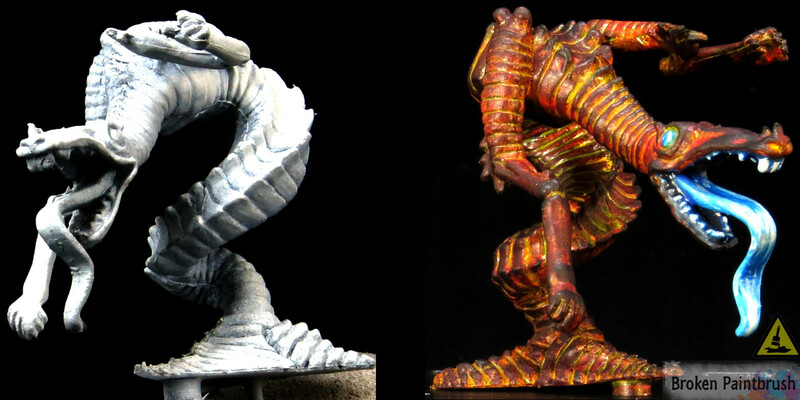 Fantasy Flight Games (the maker of MoM) decided to go with a serpentine look and mishappen arms. No one has awarded them with the greatest sculpts, but I made the most of it and went with lava or inner fire for the bodies and almost neon blue for the mouth and eyes. A quick note: don’t have time to read this now or want to save it for later? I created a downloadable PDF that I can email you for later. Fill in the subscribe box at the bottom and give it a look. Why lava skin? Well, in short because I haven’t had a chance to do so to this point, and I thought the articulated plates would lend themselves well to the style. So I went on a hunt for a good lava tutorial and came across the great Wappel’s Gollum. So armed with a plan and another guide to follow, I went from gray plastic to something that will add an extra scare factor to the game. So let’s start with the lava skin. The idea with lava and fire is that they are ‘opposite’ of what would be typical of highlighting. Meaning that the deepest areas are the lightest, brightest area (yellow in this case) and the uppermost areas go all the way to black. This gives the idea that the monster is burning with an inner fire and that it cools as it is exposed to the outside. Just as lava cools to black obsidian, the model goes all the way to black at the tips. To give the model a good base color I used Vallejo’s Model Air Hull Red. It is a rather thin red (Model Air is made for airbrushing) but provides a good foundation for the later steps. Don’t worry about being too neat or uniform as we have a bunch of layers to add. Now we start to add the brighter colors. I started with creating a wash of Game Color Moon Yellow and Airbrush medium. The Game Color line is high in pigment, so even my thinning it down a bit it still provides a strong layer into the cracks between the exoskeleton plates. After it had dried I did a second wash, but this time focusing on the cracks, making sure they were a bright yellow. With a base of yellow laid down, we start with dry brushing Game Color Orange Fire. Dry brushing is a technique that uses a stiff brush (GW creates brushes specifically for this) and brushing most of the paint off on a paper towel before applying it to the model. Dry brushing adds a layer of paint only to the raised edges of the model, leaving the yellow in the recesses. We are going to build up a few layers colors, so as you drybrush, it needs to be done lightly and focus on the upper areas of the model. Another layer of dry brush, this time with Gory Red. For the Hounds of Tindalos, I focused the dry brushing along the raised spines running along the length of the body as well as the arms and head. Moving onto a darker colors, I added Scarlet Red as the next layer. Again, keeping to the outermost areas of the monster. Now I added a bit of pure black into the Scarlet Red, creating a dark, crusty red. This was done very lightly and focusing on the spines and ends of the arms and head. It starts to give the impression of cooling lava rather than a yellow/red skin. And now pure black was applied. You need to be careful with this stage as too much black can overpower all those layers of reds we worked on. So I started with a very light dry brush over the model. This means that I loaded the brush with black and brushed it into the paper towel until almost nothing was coming off the brush. I then brushed it along the scales of the model. The trick is to drag the brush perpendicular to the ridges. This keeps it from getting to the cracks and instead hits the peaks. If you get too carried away, a quick trick is to go back to the yellow was and add a bit more color into those cracks. I ended up doing this around the eyes after painting them blue as well as some of the crevices on the body. Now we move onto the mouth and eyes. I decided to keep these the same color as to minimize the pallet. Yellow and red (the main colors of the body) are triadic compliments of blue, so it helps provide a good balance too. I started with a layer of Ultramarine Blue. Not only was this a good, intense blue, but it also covered well. This helps as I need to cover some of the red and yellow areas that were dry brushed or washed in. I based the entire mouth, tongue, teeth, and eyes. The cool color also helps make the Hounds of Tindalos seem more out of this world as most ‘natural’ creatures have warmer colors for the fleshy parts. Magic Blue was then layered on top of the Ultramarine base coat. Layering does the same effect as dry brushing in a way as the idea is to add the new color on the raised areas. But as dry brushing can be messy I didn’t want to do this in fear of getting blue on all that nicely finished skin. So instead, I painted the Magic Blue, so it covered most of the base color, leaving the ultramarine showing in the deeper cracks. But why bother adding the extra layer? Most of the Magic Blue will also get covered, but that’s ok as it is creating a lighter, consistent color for later highlighting. As the blues get lighter in color, they look even brighter when painted over a lighter undercoat, so the Magic Blue provides this for the next layer, on top of adding the color gradient into the recesses. Next up was Electric Blue. This starts to create the strange look even more as Electric Blue is almost neon in itself. For the eyes, I start to paint crescent circles on the lower, right side. With each lighter shade providing a smaller line. The gives the impression of a deep blue. Now we start to move towards the cool grays. This helps to tone down a bit of the neon look while making the teeth look more like typical teeth (albeit with blue gums). And finally, a very light Grey Blue was used to give the most extreme highlights along the edges of the tongue, the ends of the teeth and just a line along the bottom rim of the eyes. With the paints done, I removed it from the cork I was using to hold the model and re-attached it to the game base. Ideally, I would spray a few coats of matte clear paint to seal and protect all those layers. But, alas, my can has died on me, so I need to go pick up a new one. In the end, I am happy with the creep factor the Hounds of Tindalos give off. The lava skin and bright blue mouth contrast nicely. According to the mythos, the Hounds of Tindalos live in the realm of angles, entering our world through sharp corners. So when wandering mansions of questionable repute, take care for shadows moving in the cracks of our world. If you liked today’s tutorial (even if you find the Hounds a bit comical) let me know in the comments below. I am always looking for feedback on how well I presented the steps and made it clear to follow. Also, don’t forget to check out the downloadable PDF, just fill in the form and I’ll email you a copy for later reference.